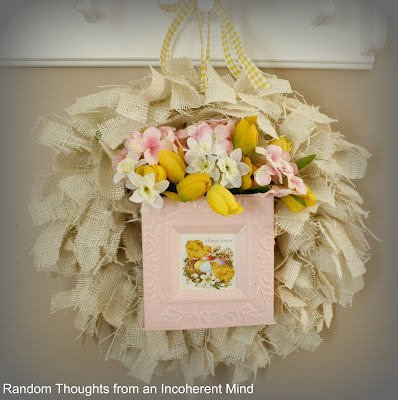 Do you remember this wreath that I shared for The Great Spring'tacular Party? I decided it was time to give it a little restyle. this little aqua watering can from The Dollar Tree. I gave this wreath a quick restyle. I have to say that Debbiedoos & her twig wreath were my inspiration. amazing results, I just had to try it with my burlap wreath. Thanks for stopping by today, lovelies! Oh yeah, quick question. Do you think my photos are too large? Your wreath is beautiful!!! Your pictures are fine in size. Your wreath is adorable, love the watering can. Your photos are perfect for viewing. You will certainly get some mileage out of that Gina. It is ADORABLE...I am pinning it now! I put a watering can on my spring wreath, but it was a grapevine wreath and yours is a hundred times cuter! I do believe it's pinspiration! Your pictures look great on my laptop Gina! I do so love the burlap wreath and the watering can just makes it! I have a green one! 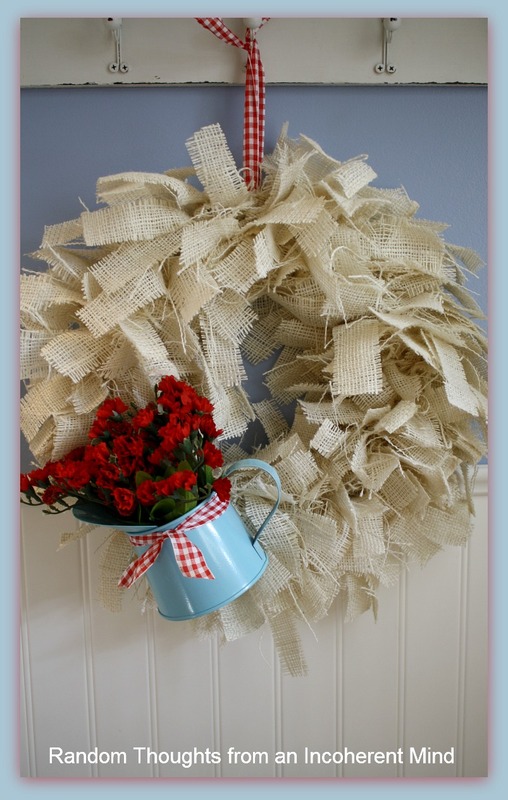 I cannot believe that I haven't made a burlap wreath! Now, I MUST! Yours is absolutely adorable! Right on trend with the aqua and red! Your photos are perfect. I work on a small notebook PC. I know that my photos are gigantor on a regular PC. Have a great day, Gina! 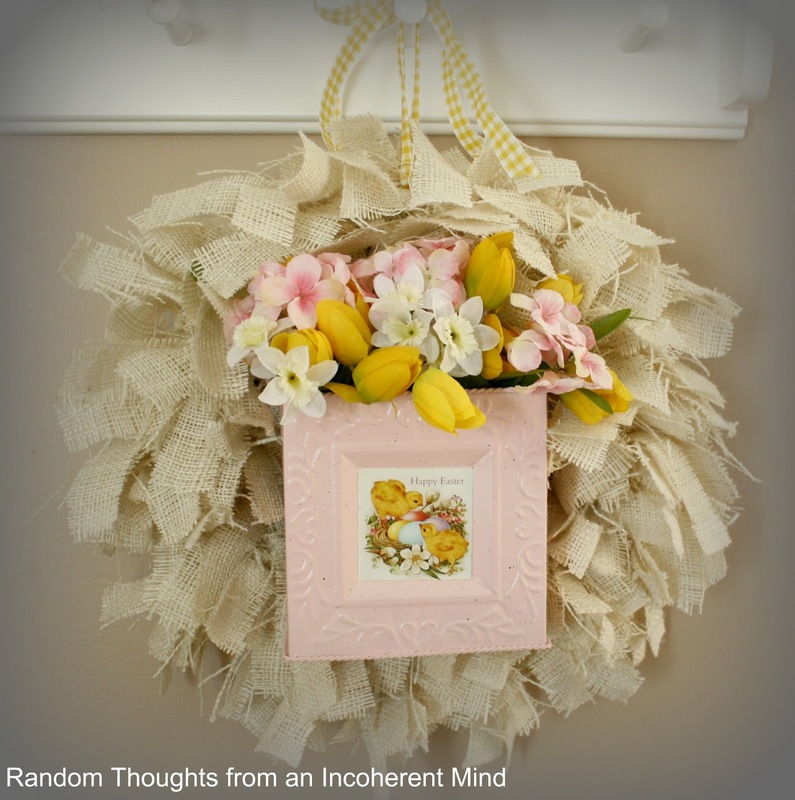 I am always trying to find new ways to restyle wreaths. They are so big and hard to store. But if you have one that can be re-style for different seasons, holidays, etc....Well you have a winner! And Ms. Gina, this is definitely a winner. Love it! Great job revamping your spring wreath! It's so cheerful and with a touch of patriotic to it.! Your pics are perfect for viewing on my large monitor...no complaints here! Super cute Gina!! I love it both ways! Can't wait to see the way you change it up for fall and winter too! Love your quick little wreath makeover! It's cute! I'll have to make something for my backdoor! Your photos look great, perfect size! 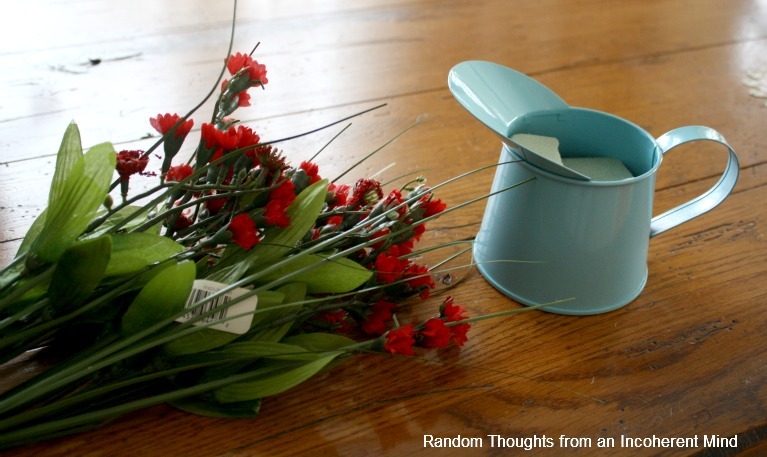 The little aqua watering can and red flowers look perfect! I love the turqoise and red together , too- looks amazing and totally refreshed to go with a new season. Super cute redo ;) I saw those little watering cans... but I couldn't think of anything I needed one for? Duh. That's what I get for thinking ;) Looks perfect on your wreath. Nope. Love them nice and BIG!! So cute! Love the red in there and the watering can was a brilliant addition! Thanks for sharing! Love the wreath. I have a wreath that I need to update. You've inspired me. Your pictures are perfect. I'd rather larger than smaller. I think the wreath is adorable! I always love red anything. Photos are perfect...no problem with size. Photos are the perfect size for me... and that wreath!! Sooo adorable! LOVE that blue color with bright red!! Sooo Cute! Pictures are perfect! Yep, we have seen quite a lot of Debbies wreath! 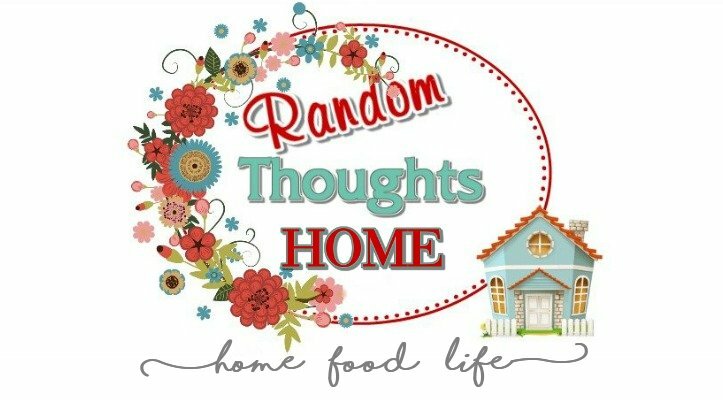 Yours looks great, I was just thinking to night as I was walking up to my house that I have to make a wreath for the front door!! What a cute wreathe Gina. LOve the watering. Great idea!! OK now I've got to make one of these! Love it! Gina, I love the re-do on your wreath! It's so perfect for this time of the year. Yes this is like my 3rd or 4th time looking at your wreath and I love it way too much. I just may be stalking your wreath at this point. You didn great. Love your makeover, perfect for Memorial Day! Can you believe it is here already! Love this wreath, it's super cute! Great work! sooooo cute..I just have to make one. I hope you have instructions somewhere on your pretty blog...I'll take a look. Gina, how did I ever miss this post! I am a "wreath lover" and yours is gorgeous! And so much fun that you can change it for the seasons! Beautiful! 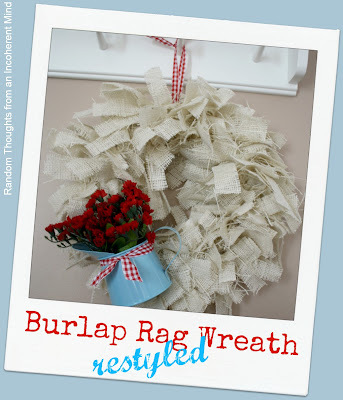 I originally pinned your wreath because I knew I could tie burlap! Last week I found a wire form for .25¢ at a garage sale so I'm ready to start copying you. The red and blue is PDC..... pretty darn cute. That is a darling transformation, Gina! I especially like that little watering can. Seriously, who wouldn't? I made one of those burlap rag wreaths a couple of years ago. Hmm.....now where did I put that.....lol!